Senator Elizabeth Warren spoke in Boston on Wednesday. Recently, a prominent Massachusetts Democrat spotted Senator Elizabeth Warren at an airport and saw an opportunity. 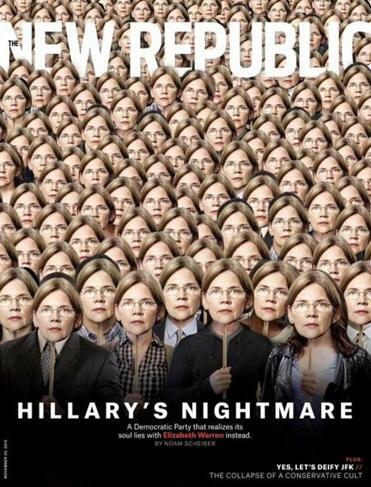 Have you read The New Republic, Philip W. Johnston asked Warren playfully, showing her the cover of the magazine he had just purchased. It was devoted to whether Warren would run for president. Warren wasn’t having any of it. She answered with an exaggerated eye roll that cut short any further talk of the 2016 presidential race. “She doesn’t want to talk about it in any serious way,” said Johnston, a supporter. 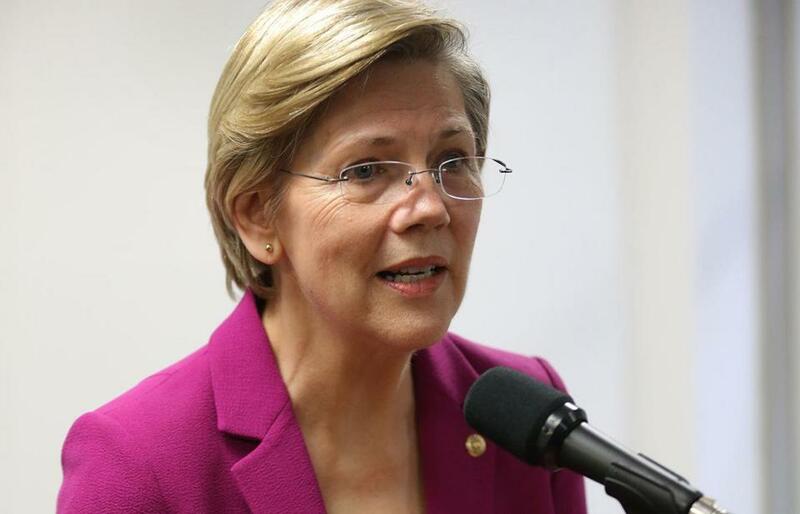 On Wednesday, Warren became so sick of media speculation that she might run as a populist alternative to Hillary Rodham Clinton that she made her most definitive statement to date in an attempt to put the issue to rest, promising to remain in the Senate. “I pledge to serve out my term,” which ends at the beginning of 2019, she said, when pressed during a news conference in downtown Boston with Mayor-elect Martin J. Walsh. In a fiery appearance before reporters, Warren acknowledged that the interest in her potential as a presidential candidate could help her advance her agenda in the Senate. But she insisted she would not fuel more speculation. For weeks, speculation about a Warren run for president has buzzed in Washington and beyond — and for weeks those around Warren have tried to tamp it down. They insist that the matter had been settled with prior statements that she had no plans to run for president. She has done nothing, for example, to curry favor in early primary states or to build her foreign policy credentials by traveling abroad. And she has signed a letter urging Clinton to run. It’s the subject that must not be broached in Warrenland. Several confidants and party activists say that Warren greets even passing references to the notion of a White House run with a derisive laugh or a cutting scowl. There has been plenty of media speculation about the senator’s plans. Even Warren’s denial on Wednesday is unlikely to squelch the interest, especially if there is any hint that Clinton is wavering or stumbling. Democrats say there would be intense pressure on Warren to run if Clinton declines. “She has made it clear she’s not running for president, but the stature she has helps her to make a difference,” said Senator Edward J. Markey, her fellow Massachusetts Democrat. The affection for Warren among liberal groups is likely to persist regardless. The same group lashed out this week at members of a centrist Democratic group who suggested in a Wall Street Journal op-ed that Warren’s ascendancy would be bad for the party. Warren has won the hearts of liberals across the country with a full-throated embrace of government as an instrument to combat income inequality against a system that is “rigged” for the rich and powerful. She has embraced an expansion of Social Security, fought against the power of big banks, put public pressure on government regulators to crack down on financial institutions, and spoken in favor of raising the minimum wage. Her speeches, including a passionate keynote address at the AFL-CIO conference in September, have helped make her the face of liberal populism that has partially reshaped the Democratic Party. During last year’s campaign, she collected $42 million in donations, more than any other Senate candidate, much of it from small online donors. How well all that would translate to a national presidential campaign is unclear. While she could be a serious factor in a Democratic primary, her message likely would be received more skeptically on the broader national stage than in the liberal bastions of the Northeast. There are potential risks as well as rewards with the recent frenzy of publicity about her non-candidacy — which has included front page articles in the Washington Post and New York Times in addition to the cover story in liberal magazine The New Republic and endless speculation on liberal blogs. The attention gives Warren outsized stature for a freshman senator, further raising her influence on the populist anti-Wall Street issues that have been her life’s work. Warren, 64, could continue to build her network and further expand her fund-raising base for a potential 2020 presidential campaign, when she would be 71 years old. Warren’s followers are zealous members of the party’s grass roots, who swarm to her at public appearances and turn videos of her speeches into viral phenomena. But overt interest in presidential politics risks alienating more senior senators and could lead others to question Warren’s motives when she advocates for policy. “It’s good for your brand but not good for getting things done,” said a party insider. In addition, she would risk upsetting the voters who put her in office only a year ago if she appears distracted by a higher calling. That is one of the reasons her inner circle has been careful to avoid any appearance that she is stoking the speculation. Even talking about her lack of enthusiasm for the job is so sensitive that many people interviewed for this article would not speak on the record. Other notables, including her finance chairman Paul Egerman, would not talk at all when a reporter called asking generically to speak about Warren. Governor Deval Patrick, who has also had to squelch some speculation about his own presidential ambitions, offered a terse statement through a spokeswoman when asked if he has talked about it with Warren. “It just doesn’t come up,” he said. Some say the attention on Warren has more to do with what she symbolizes than her actual candidacy, real or fictional. Fantasizing about a Warren presidential bid offers a vehicle for the segment of Democrats who embrace a more robust discussion of income inequality, for instance, giving voice to dissatisfaction within the party over the presumption that Clinton will be the 2016 nominee. Most party activists and fund-raisers expect Clinton will run and consolidate establishment support from around the country, including in Massachusetts, based in part on her and her husband’s longstanding relationships in the state. “There just seems to be a sense that Hillary is inevitable and I think most of us are comfortable with Hillary,” said Johnston, a former state party chair who is also a member of Warren’s finance committee.